The Indian Army has an inventory of over 500,000 items. At any time, the army has to be ready to rapidly deploy resources to various locations at short notice. Improved efficiency can occur with automation- and technology-based processes. An army, air force or navy is not just about the quality and efficiency of the weapons it has. No doubt, that the best fighter jets, armaments and gun-ships are essential for the defence forces. However, the best of machines and soldiers can fail if they are not backed by the best logistical systems. Defence forces around the world are investing in technologies that make them more efficient and agile in a conflict. While robotics and remote warfare using autonomous vehicle grab the headlines, the heavy lifting is done by the supply chain that supports the forces. Increasingly, the forces are opting for smart logistics solutions that allow them to keep track of people and machines. India, too, has been moving ahead on this front. The Indian Army has set in place automation software to manage its logistics. Called the Integrated Quarter Master Package (IQMP) software package, it has been developed by the Army Software Development Centre along with Tata Consultancy Services. IQMP is meant to replace numerous applications and integrate the entire logistics management process on one platform. According to a statement by the army, this 'comprises 13 modules to automate all the logistics functions at unit level. The application can be dynamically configured to meet the specific requirements of various types of army units and is capable of sharing information and data with other software applications in the domain of logistics management'. Logistics management for the army is focused mostly on inventory tracking, procurement and resource management. 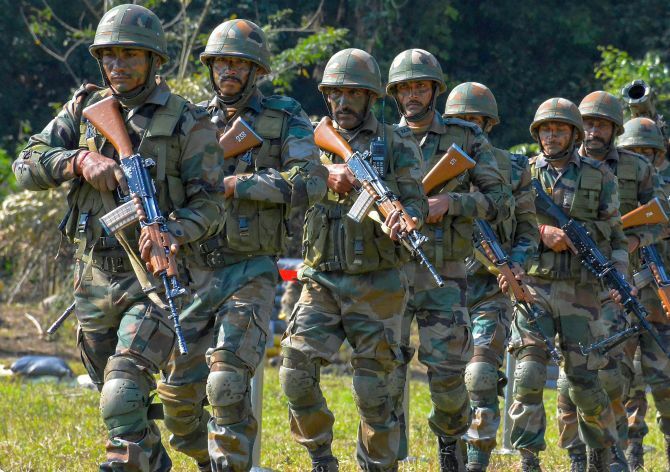 'Standalone packages implemented by army, navy and air force need to be integrated into a single system, which would, in turn, ensure seamless integration across and between processes,' says a paper by the Centre for Land Warfare Studie). This process is being enhanced by various agencies of the defence forces. The Society of Indian Defence Manufacturers is working with the defence forces to identify how new and cutting-edge technology solutions, including automation, can be deployed for various purposes. Indian industry is working with the forces to identify the need for specific requirements so that companies can begin investing in them. Automated minefield detection system: The hand held GIS- and GPS-based system should accurately and automatically record all the minefield data on to digitised maps. Cognitive radios: There is a need for radios that use intelligence to automatically adapt themselves to user needs and bandwidth requirements -- Cognitive Radios. This would include various levels of self-configuration including automatic mode selection, optimal power output, power consumption and spectrum access. Electronic warfare:The development of this requires indigenous effort since external vendors can't be trusted. Some examples include advanced analytical software for spectrum capture including automatic location finding, fractal antennas, anti UAVs and radio finger printing. Developing an automated system monitoring the health of equipment is a critical need for the army. The defence forces are working on various solutions for this. Data analytics for managing the information is helping the forces analyse their operations within a shorter time cycle. Not just manufacturing, but digital tech has to be part of promoting indigenous defence capabilities.